Cheap Xbox One Controller Deals and Offers! Looking for cheap Xbox One controller? Find the latest and the best Xbox One controller discounts, offers sales and voucher codes here at Latest Deals as well cheap Xbox One console deals from big retailers like Tesco, Asda, Amazon, eBay and Game! 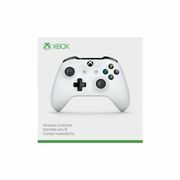 Xbox One Wireless Controller Crete White (Free UK Delivery). YOU SAVE £13. It’s quite tricky to find an Xbox One controller deal, especially if you’re looking on high street retailers where they don’t normally offer amazing discounts. Fortunately, you can find great value for your money online where it’s more competitive and that’s where we come in. Our massive community of bargain hunters are always on the lookout every month to find the best possible deals that you can take advantage of both online and in store. 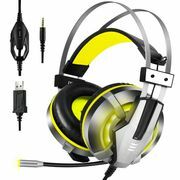 With cheap Xbox One controller and Xbox One console offers from Amazon, eBay, Game, Tesco, Asda and more, you’re sure to have a more enjoyable gaming experience while still staying within your budget. The main controller of the Microsoft Xbox One console is the Xbox One controller. It keeps the Xbox 360 controller’s overall layout but with some changes on its shape, analog sticks, triggers and shoulder buttons. It also added new vibrators within its triggers that allows for directional haptic feedback. The controller underwent around three revisions with numerous changes to its functionality and design. A lot of money have gone to its development in order for the company offer the perfect design while still keeping the things gamers loved with the design of the Xbox 360 controller. Microsoft also launched the premium version Elite Wireless Controller for professional gamers which includes features such as programmability features and interchangeable parts. In addition, both the standard and premium controllers come in various colours and some even features special designs tying them into particular games. Since the company partners with Oculus VR, both the controllers are bundled with the Oculus Rift VR headset. On the other hand, the Day One Edition controller features a chrome coloured D-pad as well as a special stamp showing that it’s a Day One Edition. The handler contour is different. Different A, B, X and Y face buttons. It comes with a directional pad and a couple of buttons. The Menu and View where the Start and Back were are different as well. Compared to the PS4 which supports 4 controllers, the Xbox one controller support 8. And compared to the standard black, its day one controller comes with a special text in the middle as well as a metallic d-Pad. Furthermore, it features 40 improvements on its design making it more intuitive and comfortable to use. Compared to previous Xbox controllers, its directional pad has a more traditional look to it with a slimmer battery compartment. While its triggers have a built-in rumble system called Impulse Triggers which has a forced vibration directly built into the triggers, which gamers can use in games like Forza. Where can I find cheap Xbox One controller? 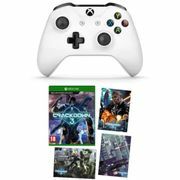 You can find great Xbox One controller deals here at Latest Deals as well as voucher codes, discount codes and the latest offers from massive retailers like Tesco and Currys to online gaming retailers such as Game and CEX. Online retailer giants Amazon and eBay offers cheap new and used. Xbox One controllers. Xbox One controller eBay deals include the original and elite controllers as well as special edition controllers. The official wireless controller ranges from £20 to £50 with free delivery, while the Elite controller ranges from £80 to £100 with free delivery as well. On the other hand, cheap Xbox One controller Amazon deals ranges from £25 to £45 on the original design. They also have a list of top selected controllers with reviews to narrow down your choices. A reminder though, when buying from third-party sellers, make sure to check the ratings and reviews of each sellers and always ask for the real photos of the item before buying anything from them. Xbox One Asda deals are quite limited. The Xbox One Wireless Asda deals include either the colour black or white with a tag price of £55 and stocks are always running out. They do have a decent line up of Xbox One games though. If you want more choices, Argos Xbox One line up is quite good and you can choose from different colours and designs as well. With prices ranging from £24.99 to £64.99 and some with discounts ranging from £5 to £8, you will never run out of options for sure to save money. Plus if you’re looking for a cheap Xbox One console, they often have clearance sales on their gaming consoles where you even have a 12-months to pay option if you have an Argos card. Xbox One Game selection of controllers is probably one of the most extensive. They come in all sorts of shapes, sizes and designs, from carbon fibre to Pokemon edition Xbox One controllers. Their cheapest controller priced at £24.99 is already a Pro Ex controller while the Xbox One Wireless Controller Official Dusk Shadow is the most expensive at £199.99. They also offer free UK delivery on all controllers. You can charge your Xbox One controller using a micro-USB which is not included. You can also use AA batteries (standard or rechargeable). In addition, when the micro-USB is plugged into your controller for use in wired play, it’ll shut off the internal radio and all the data will be transmitted via the wire. So when it’s in this mode, you can use your controller without batteries. Furthermore, to aid in conserving the life of your batteries, the controller has a low power state feature when it’s not in use. This prevents it from draining the battery’s energy when it’s away from the console or while watching movies. Note that this applies to both individually both and controllers that came with your console, just make sure that it’s still under the standard 90-days warranty. Your Xbox console is required to be registered to qualify for a replacement even if it is purchased separately. You can log in to your Xbox account of register one if you haven’t already. If your console is not listed, simply select “Register device” then enter all the necessary info of your device. Select Xbox on the list of Microsoft devices. Select “Accessories” under “Pick a category” and then “Controller” under “Select Issue Type”. Choose the controller that needs to be replaced and then enter its 14-digit number which is located in its battery compartment just below its barcode. Choose “Create a repair order”, follow the steps that follows and then send in the controller.